Mathematical Economics, Mathematical Finance, Random dynamical systems, Stochastic optimization and games. Society for the Advancement of Economic Theory, Founding Fellow, since 2011. Moscow Mathematical Society, elected in 1989. Behavioral and Evolutionary Finance. Joint work with R. Amir, Economics Department, University of Iowa, T. Hens, Swiss Institute of Banking, University of Zurich, and K.R. Schenk-Hoppé, University of Manchester. Von Neumann-Gale dynamical systems with applications in Economics and Finance. Joint work with K.R. Schenk-Hoppé, University of Manchester, S.A. Pirogov, Institute for Information Transmission Problems (IITP), Russian Academy of Sciences, and M.V. Zhitlukhin, Steklov Mathematical Institute, Russian Academy of Sciences. Controlled random fields: theory and applications. Joint work with S.A. Pirogov, Institute for Information Transmission Problems (IITP), Russian Academy of Sciences, and M.V. Zhitlukhin, Steklov Mathematical Institute, Russian Academy of Sciences. 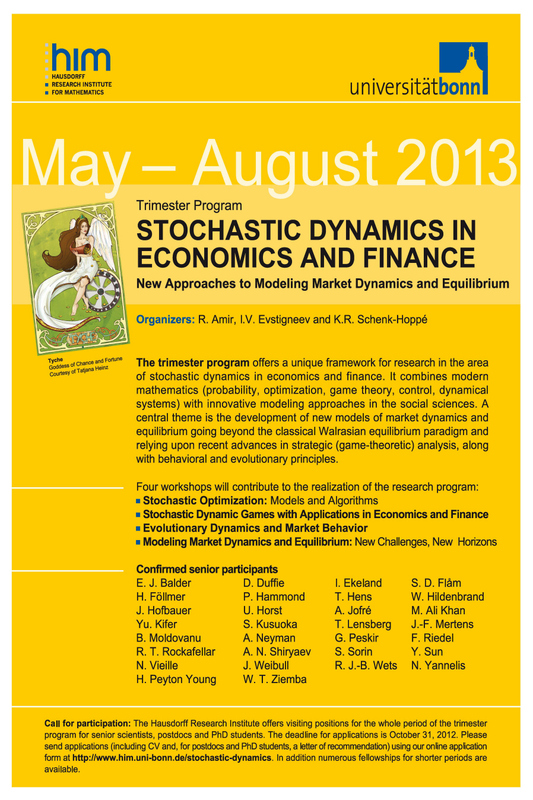 Stochastic models of control and economic dynamics. Academic Press, London, 1987 (with V.I. Arkin). Markov fields over countable partially ordered sets: Extrema and splitting. Memoirs of Amer. Math. Soc., v. 112 (537), 1994 (with P.E. Greenwood). Von Neumann-Gale model, market frictions, and capital growth, SSRN Working Paper 3314852, January 2019 (with E. Babaei, K.R. Schenk-Hoppé and M.V. Zhitlukhin). Log-optimal and rapid paths in von Neumann-Gale dynamical systems, Economics Discussion Paper EDP-1902, The University of Manchester, January 2019 (with E. Babaei and K.R. Schenk-Hoppé). Von Neumann-Gale dynamics and capital growth in financial markets with frictions, Economics Discussion Paper EDP-1815, The University of Manchester, November 2018 (with E. Babaei, K.R. Schenk-Hoppé and M.V. Zhitlukhin). A multidimensional Fatou lemma for conditional expectations, arXiv:1811.00640 [math.OC], November 2018 (with E. Babaei and K.R. Schenk-Hoppé). Nash equilibrium strategies and survival portfolio rules in evolutionary models of asset markets, Swiss Finance Institute Research Paper No. 17-17, 2017 (with S. Belkov, T. Hens and L. Xu). Evolutionary finance models with short selling and endogenous asset supply, Swiss Finance Institute Research Paper No. 17-26, 2017 (with S. Belkov and T. Hens). An evolutionary finance model with a risk-free asset, Swiss Finance Institute Research Paper No. 17-28, 2017 (with S. Belkov and T. Hens). A new perspective on the classical Cournot duopoly, 2017, Journal of Dynamics and Games, 4, 361-367 (with R. Amir). On Zermelo's theorem, 2017, Journal of Dynamics and Games, 4, 191-194 (with R. Amir). Growth-optimal investments and numeraire portfolios under transaction costs, 2013, in: Handbook of the Fundamentals of Financial Decision Making ( L.C. MacLean and W.T. Ziemba, eds. ), World Scientific, Singapore, pp. 789-808 (with W. Bahsoun and M.I. Taksar). Controlled random fields, von Neumann-Gale dynamics and multimarket hedging with risk, 2013, Stochastics, v. 85, 652-666 (with M.V. Zhitlukhin). Asset market games of survival: A synthesis of evolutionary and dynamic games, 2013, Annals of Finance, 9, 121-144 (with R. Amir and K.R. Schenk-Hoppé). Evolutionary finance and dynamic games, 2011, Mathematics and Financial Economics, v. 5, 161-184 (with R. Amir, T. Hens and L. Xu ). Local stability analysis of a stochastic evolutionary financial market model with a risk-free asset, 2011, Mathematics and Financial Economics, v. 5, 185-202 (with T. Hens and K.R. Schenk-Hoppé). Linearization and local stability of random dynamical systems, 2011, Proceedings of the American Mathematical Society, v. 139, 1061-1072 (with K.R. Schenk-Hoppé and S.A. Pirogov). Almost sure Nash equilibrium strategies in evolutionary models of asset markets, Mathematical Methods of Operations Research, 2011, v. 73, 235-250 (with W. Bahsoun and L. Xu ). Survival and evolutionary stability of the Kelly rule, 2011, in: The Kelly Capital Growth Investment Criterion: Theory and Practice (L.C. MacLean, E.O. Thorp and W.T. Ziemba, eds. ), World Scientific, Singapore, pp. 273-284 (with T. Hens and K.R. Schenk-Hoppé). Growing wealth with fixed-mix strategies, 2011, in: The Kelly Capital Growth Investment Criterion: Theory and Practice (L.C. MacLean, E.O. Thorp and W.T. Ziemba, eds. ), World Scientific, Singapore, pp. 427-455 (with M.A.H. Dempster and K.R. Schenk-Hoppé). Stochastic nonlinear Perron-Frobenius theorem, 2010, Positivity, v. 14, 43-57 (with S.A. Pirogov). Arbitrage in stationary markets, 2009, Decisions in Economics and Finance, v. 32, 5-12 (with D. Kapoor). Dynamic interaction models of economic equilibrium, 2009, Journal of Economic Dynamics and Control, v. 33, 166-182 (with M.I. Taksar). Evolutionary finance, 2009, in: Handbook of Financial Markets: Dynamics and Evolution (T. Hens and K.R. Schenk-Hoppé, eds. ), a volume in the Handbooks in Finance series, W.T. Ziemba, ed., Elsevier, Amsterdam, pp. 507-566 (with T. Hens and K.R. Schenk-Hoppé). Globally evolutionarily stable portfolio rules, 2008, Journal of Economic Theory, v. 140, 197-228 (with T. Hens and K.R. Schenk-Hoppé). Financial markets. The joy of volatility, 2008, Quantitative Finance, v. 8, 1-3 (with M.A.H. Dempster and K.R. Schenk-Hoppé). Stochastic equilibria in von Neumann-Gale dynamical systems, 2008, Transactions of the American Mathematical Society, v. 360, 3345-3364 (with K.R. Schenk-Hoppé). A stochastic contraction principle, 2007, Random Operators and Stochastic Equations, v. 15, 155-162 (with S.A. Pirogov). Volatility-induced financial growth, 2007, Quantitative Finance, v. 7, 151-160 (with M.A.H. Dempster and K.R. Schenk-Hoppé). Reprinted in: Quantitative Fund Management, M.A.H. Dempster, G. Mitra and G. Pflug, eds., Chapman and Hall / CRC Financial Mathematics Series (Taylor and Francis Group), 2009, 67-84. Pure and randomized equilibria in the stochastic von Neumann-Gale model, 2007, Journal of Mathematical Economics, v. 43, 871-887 (with K.R. Schenk-Hoppé). Asset pricing and hedging in financial markets with transaction costs: An approach based on the von Neumann-Gale model, 2006, Annals of Finance, v. 2, 327-355 (with M.A.H. Dempster and M.I. Taksar). The von Neumann-Gale growth model and its stochastic generalization, 2006, in: Handbook on Optimal Growth, R.-A. Dana, C. Le Van, T. Mitra and K. Nishimura, eds., Springer, New York, 337-383 (with K.R. Schenk-Hoppé). Evolutionary Stable Stock Markets, 2006, Economic Theory, v. 27, 449-468 (with T. Hens and K.R. Schenk-Hoppé). Market selection and survival of investment strategies, 2005, Journal of Mathematical Economics, Special Issue on Evolutionary Finance, v.41, 105-122 (with R. Amir, T. Hens and K.R. Schenk-Hoppé). On the Fundamental Theorem of Asset Pricing: Random constraints and bang-bang no-arbitrage criteria, 2004, Mathematical Finance, v.14, 201-221 (with K. Schuerger and M.I. Taksar). Noncooperative versus cooperative R&D with endogenous spillover rates, 2003, Games and Economic Behavior, v. 42, 183-207 (with R. Amir and J. Wooders). Exponential growth of fixed-mix strategies in stationary asset markets, 2003, Finance and Stochastics, v. 7, 263-276 (with M.A.H. Dempster and K.R. Schenk-Hoppé). From rags to riches: On constant proportions investment strategies, 2002, International Journal of Theoretical and Applied Finance, v. 5, 563-573 (with K.R. Schenk-Hoppé). Equilibrium states of random economies with locally interacting agents and solutions to stochastic variational inequalities, 2002, Annals of Operations Research, Special Issue ''Stochastic Equilibrium Problems in Economics and Game Theory'', v. 114, 145-165 (with M.I. Taksar). Market selection of financial trading strategies: Global stability, 2002, Mathematical Finance, v. 12, 329-339 (with T. Hens and K.R. Schenk-Hoppé). Convex stochastic duality and the ''biting lemma'', 2002, Journal of Convex Analysis, v. 9, 237-244 (with S.D. Flåm). Sharing nonconvex costs, 2001, Journal of Global Optimization, Special Issue on Applications to Economics, v. 20, 257-271 (with S.D. Flåm). Convex stochastic optimization for random fields on graphs: A method of constructing Lagrange multipliers, 2001, Mathematical Methods of Operations Research, v. 54, 217-237 (with M.I. Taksar). Rapid growth paths in convex-valued random dynamical systems, 2001, Stochastics and Dynamics, v. 1, 493-509 (with M.I. Taksar). Stochastic programming: Non-anticipativity and Lagrange multipliers, in: Encyclopedia of Optimization, Kluwer Academic Publishers, Dordrecht, 2001, v. 4, 332-338 (with S.D. Flåm). On Dynkin's model of economic equilibrium under uncertainty, 2001, Economics Bulletin, v. 3, 1-8 (with G. Carlier). A functional central limit theorem for equilibrium paths of economic dynamics, 2000, Journal of Mathematical Economics, v. 33, 81-99 (with R. Amir). Turnpike theorems for positive multivalued stochastic operators, 2000, Advances in Mathematical Economics, v. 2, 1-20 (with S. Anoulova and V.M. Gundlach). Robust insurance mechanisms and the shadow prices of information constraints, 1999, Journal of Applied Mathematics and Decision Sciences, v. 3, 85-128 (with W.K. Klein Haneveld and L.J. Mirman). Convex-valued random dynamical systems: A variational principle for equilibrium states, 1999, Random Operators and Stochastic Equations, v. 7, 23-38 (with L. Arnold and V.M. Gundlach). Stochastic version of Polterovich's model: Exponential turnpike theorems for equilibrium paths, 1999, Macroeconomic Dynamics, v. 3, n. 2, 149-166 (with R. Amir). Rapid growth paths in multivalued dynamical systems generated by homogeneous convex stochastic operators, 1998, Set-Valued Analysis, v. 6, 61-82 (with S.D. Flåm). Balanced states in stochastic economies with locally interacting agents, 1998, Stochastics, v. 64, 235-253 (with M.A.H. Dempster and S.A. Pirogov). The turnpike property and the central limit theorem in stochastic models of economic dynamics, 1997, in: Statistics and Control of Stochastic Processes, The Liptser Festschrift, Yu.M. Kabanov, B.L. Rozovskii, and A.N. Shiryaev, eds., World Scientific, Singapore - New Jersey - London, 63-101 (with S.D. Flåm). Noncooperative games in networks: Stability and sensitivity of equilibria, 1997, in: Complementarity and Variational Problems: State of the Art, M.C. Ferris and J.-S. Pang, eds., SIAM, Philadelphia, 62-75 (with S.D. Flåm). Metonymy and cross section demand, 1997, Journal of Math. Economics, v. 28, 397-414 (with W. Hildenbrand and M. Jerison). Turnpike theorems for stochastic equilibria on graphs, 1996, in: Operations Research Proceedings 1995, P. Kleinschmidt et al., eds., Springer-Verlag, Berlin - Heidelberg - N.Y., 241-245 (with M.A.H. Dempster and S.A. Pirogov). The shortest path around an island outside the shallows, 1995, Markov Processes and Related Fields, v. 1, 407-418. Stochastic equilibria on graphs, 1995, II, Journal of Math. Economics, v. 24, 383-406 (with M.I. Taksar). Stochastic equilibria on graphs, 1994, I, Journal of Math. Economics, v. 23, 401-433 (with M.I. Taksar). A limit theorem for random matrices with a multiparameter, 1994, Stochastic Processes and their Appl., v. 52, 65-74 (with K. Schuerger). Regular conditional expectations and the continuum hypothesis, in: The Dynkin Festschrift, Birkhauser, Boston, 1994, 85-93. Stochastic extrema, splitting random elements and models of crack formation, in: System Modelling and Optimization, Proc. of the 16th IFIP-TC7 Conf. (Compiègne, July 5-9, 1993), Lecture Notes in Control and Inform. Sci., No. 197, Springer-Verlag, London, 1994, 315-319 (with P.E. Greenwood). Controlled random fields on graphs and stochastic models of economic equilibrium, 1991, in: New Trends in Probability and Statistics (Volume in Honour of Yu. V. Prohorov), VSP, Utrecht, 391-412. The method of monotone operators in the stochastic theory of economic equilibrium, 1990, Matekon, v. 26, n. 3, Sharpe Publ., N.Y., 21-43. Stochastic extremal problems and the strong Markov property of random fields, 1988, Uspekhi Matem. Nauk (Russian Math. Surveys), v. 43, n. 2, 3-41. Measurable images of compact spaces and selectors of analytic sets, 1988, Doklady AN SSSR (Soviet Math. Dokl. ), v. 299, n. 3, 538-541. Controlled random fields on a directed graph, 1988, Teor. Ver. i Primen. (Theory of Probab. and Appl. ), v. 33, n. 3, 465-479. Random sets and Markov fields (Invited paper), 1987, in: Proc. of the 1st World Congress of the Bernoulli Soc.,Tashkent, Sept. 1986. Utrecht, VNU, 339-344. Measurable selection theorems and stochastic control models in general topological spaces, 1986, Mat. Sbornik (Math. USSR Sbornik), v. 131, n. 1, 27-39. Regular conditional expectations of random variables depending on parameters, 1986, Teor. Ver. i Primen. (Theory of Probab. and Appl. ), v. 31, n. 3, 586-589. Equilibrium states of monotone operators and equilibrium trajectories in stochastic economic models, 1986, Lect. Notes Control Inf. Sci., n. 81, 334-338. Stochastic models of economic dynamics and equilibrium: Asymptotic behaviour of equilibrium paths, 1984, in: Proc. of the Seventh Conf. on Probab. Theory (Brasov 1982), Bucharest, 149-158 (with P.K. Katyshev). An optimality principle and an equilibrium theorem for controlled random fields on a directed graph, 1984, Doklady AN SSSR (Soviet Math. Dokl. ), v. 274, n. 4, 782-786. Strong Markov property and splitting elements for random fields over a partially ordered set, 1983, Teor. Ver. i Primen. (Theory of Probab. and Appl. ), v. 28, n. 4, 801-802. Probabilistic variant of the turnpike theorem for homogeneous convex controllable models, 1983, Math. Zametki (Math. Notes), v. 33, n. 1, 185-194 (with S.E. 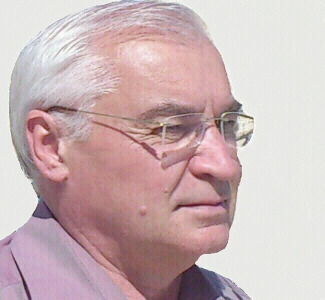 Kuznetsov). Equilibrium paths in probabilistic models of economic dynamics, 1982, Teor. Ver. i Primen. (Theory of Probab. and Appl. ), v. 27, n. 1, 120- 128 (with P.K. Katyshev). Homogeneous convex models in the theory of controlled random processes, 1980, Doklady AN SSSR (Soviet Math. Dokl. ), v. 253, n. 3, 524-527. Probabilistic modification of the von Neumann-Gale model, 1980, Uspekhi Matem. Nauk (Russian Math.Surveys), v. 35, n. 4, 185-186 (with Yu.M. Kabanov). Measurable choice and the continuum axiom, 1978, Doklady AN SSSR (Soviet Math. Dokl. ), v. 238, n. 1, 11-14. ''Splitting times'' for random fields, 1978, Teor.Ver. i Primen. (Theory of Probab. And Appl. ), v. 23, n. 2, 433-438 (with A.I. Ovseevich). ''Markov times'' for random fields, 1977, Teor.Ver. i Primen. (Theory of Probab. and Appl. ), v. 22, n. 3, 575-581. Turnpike theorems in stochastic models of economic dynamics, 1976, Mat. Zametki (Math. Notes), v. 19, n. 2, 279-290. Optimal economic planning under production uncertainty, 1976, Publ. économétr., v. 9, n. 1, 81-98. Lagrange multipliers for the problems of stochastic programming, 1976, Lect. Notes Econ. Math. Syst., n. 133, 34-48. Measurable selection and dynamic programming, 1976, Math. Oper. Res., v. 1, n. 3, 52-55. Regular conditional expectations of correspondences, 1976, Teor. Ver. i Primen. (Theory of Probab. and Appl. ), v. 21, n. 2, 333-347 (with E.B. Dynkin). The space 2X and Markov fields, 1976, Doklady AN SSSR (Soviet Math. Dokl. ), v. 230, n. 1, 22-25. Models of economic dynamics taking account of indeterminacy in the operation of an industrial process, 1975, Doklady AN SSSR (Soviet Math. Dokl. ), v. 223, n. 3, 537-540. Positive matrix-valued cocycles over dynamical systems, 1974, Uspekhi Matem. Nauk (Russian Math. Surveys), v. 29, n. 5, 219-220. Optimal stochastic programs and their supporting prices, 1974, in: Mathematical Models in Economics, Amsterdam, North Holland, 219-252. Optimal economic planning taking account of stationary random factors, 1972, Doklady AN SSSR (Soviet Math. Dokl. ), v. 206, n. 5, 1040-1042. Markov chains on a matrix group, 1971, Mat. Zametki (Math. Notes), v. 10, n. 2, 181-186.